What foolish Harriet did befell. . ."
The special effect that seals Harriet's fate is a flaming red dress. CurtainUp first reported on the macabre Grand Guignol charms of this inventive musical adaptation of Dr. Heinrich Hoffman's grimmer than the Grimm Brothers' grimmest tales when it played for just five performances at the Kennedy Center in DC. When I had a chance to see the show during a somewhat longer but still brief run at the New Victory Theater, I too was mesmerized by the stagecraft, performances and the Tiger Lillies' tantalizing music, especially Martyn Jacques' castrato crooning. Dr. Hoffman would no doubt be thrilled to see his answer to the sugar-laden stories that predominated children's literature in 1844 brought to such invigorating, entertaining life -- though the appeal is really more to adults than children. In the five years since those first reviews were posted, the show has won new fans in its travels to many other stages. Now it's come back to the Big Apple for a longer stay. So how does it fare at the Little Shubert Theater on Theater Row? And does it hold up well enough to fill 500 seats for a healthy run? With New York audiences' eyes glazing over at lifeless, charmless shows like Brooklyn and Good Vibrations, the bizarre charm of this "junk opera" comes like a fresh breeze from the Hudson. The Little Shubert is big enough to accommodate a large audience but not too big for the voices to require overmiking and sound cavernous. I would caution, however, that as a family show this strikes me even more now than at the New Victory as being subject to knowing the kids you plan to bring. I brought a 10 year-old who found the "Snip Snip" treatment of thumbs and "The Dreadful Story About Harriet and the Matches" too scary. Her 14-year-old sister liked the music of the Tiger Lillies but would have preferred a less measured pace. On second viewing I do think that the show would benefit from losing about 10 minutes. While tickets at the Little Shubert cost more than they did at the family budget friendly New Victory, beer pocketbook theater goers take heart. Each performance will have 18 $20 tickets for the first row of the orchestra available by lottery 90 minutes before the performance (a limit of 2 per person). If you're lucky enough to nab a ticket, you can treat yourself to a goodie at The Little Pie Shop on 43rd Street. Another bargain hunter's option is to book the Thursday at 10pm performance at which all seats are just $25 (that performance time will attract the young adults who are likely to be the show's biggest fans). Below the current production notes along with a song list (Tiger Lillies CDs are available in the lobby-- with the musicians, still in makeup and costumes, on hand to sign them for you). Created by Julian Bleach, Anthony Cairns, Julian Crouch,Graeme Gilmour, Tamzin Griffin,Jo Pocock, Phelin McDermott, Michael Morris and The Tiger Lillies Martyn Jacques, Adrian Huge and Adrian Stout. Tues, Wed, Fri, & Sat @ 8:00PM, Thurs @ 10:00PM (all tickets $25!) , Sat @ 3:00PM, Sun @ 2:00PM & 7:00PM. OK for kids ? -- the question mark here is a youngster's ability to deal with this scary stuff about parents who demand perfection. It also takes an appreciation of this deliberately slow pace by young and old. The interview with the show's British producer Michael Morris referred to at the end of my review of the New Victory production should be kept in mind. It stated that the show was never conceived as a children's show and that the few performances at which children predominated did not work and that he considered the ideal audience mainly composed of adults but with kids represented. This was the case at the New Victory (which recommended it for Kids of at least 12, and at the Little Shubert evening performance I attended at which the kids were very much in the minority. Here is cruel Frederick, see! For his comeuppance Frederick was sent to bed with a bad-tasting tonic. Susan Davidson ended her report on this terrific new look at a grizzly children's tale stating "If this show does not become a hit with New York's hip theatre crowd, I'll go to bed without my supper." Well, no comeuppance for you, Susan. Tuck in your bib and bon appetit. The crowd I saw at the New Victory did indeed respond with a hip, hip and hurrah to the Improbable Theater Group's "junk opera." Given the show's short run I won't burden you with a lengthy second rappraisal so you can use the time to call up for a ticket and see it all for yourself. I would add that while the New Victory has a double balcony, it is not cavernous like the Kennedy Center so Martyn Jacques' amazing falsetto and all the lyrics come across very clearly. A word too about Susan's suggestion to leave the kiddies at home despite this being based on a book of rhymes for toddlers. The people at the New Victory box office bill the show as for those aged 12 and up. In an interview in The New York Times the show's British producer, Michael Morris bears this out. 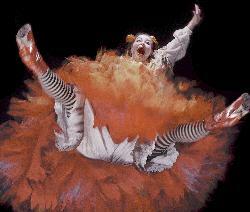 Morris admits that the show was never conceived as a children's show and that the few performances at which children predominated did not work. On the other hand, he sees it as a show for many audiences which works best when all those audiences, including kids, are represented. The matinee I attended had just the mix he considers ideal. Adults predominated but there was also a substantial sprinkling of youngsters, some no more than six or seven. I didn't hear one frightened scream. The predominant noise from the audience, young and old, was laughter. As someone who was raised on Struwwelpeter and has kept her nails neatly trimmed ever since, I might add that this inspired deconstruction has laid the childish tremblings it inspired (but not the fascination) to rest on a ripple of laughs. I think I'll grow myself some of those long purple nails I see on women whose nurseries contained only the most politically correct, non-scary books.